Sharon’s teaching springs from great gratitude and joy. 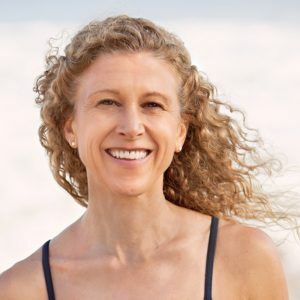 She began studying yoga at age 14 and has continued to practice asana and pranayama throughout her life. Her primary yoga teacher is Ana Forrest, although she has studied with, and been influenced by, many other luminaries. A person who likes to laugh and have fun, but also enjoys serious conversation, Sharon wants to get to know you both on and off the mat. A good listener and fun seeker, she will join you for a bike ride, wine tasting, or an impromptu walk into town to try her rusty college French. Her morning Vinyasa classes are a strong, modern, all-level, inclusive style that challenges students through attention to breath and posture while cultivating feeling and presence. Sharon offers clear and kind instruction, demonstrations and hands-on assists to help students progress safely. Evening Restorative and Yin classes, influenced by her studies with Judith Lasater, Rodney Yee, and Sarah Powers, are an opportunity to unwind and release muscles and experiences from the day. Sharon began leading retreats in Mexico in 2006, and has since led many successful retreats in Mexico and Northern California. She loves to travel, and has journeyed throughout Europe and South America. As a college student, she lived, worked and studied in France for a six-month Foreign Study program, and has returned various times for work and vacation. She is comfortable with the culture and the language, and so can help guide you. When not teaching yoga, Sharon loves to cook, shop at Farmer’s Markets, and enjoy good wine. Sharon has over 20 years of teaching experience. She is a Level 2 Certified Forrest Yoga Teacher who assists Ana Forrest with her trainings and workshops. She received her Pre/Post-Natal Yoga Certification from Jane Austin of Mama Tree Yoga in 2017. Today, Sharon teaches a full schedule of classes to include Forrest, Restorative, Prenatal, Corporate, Private, and working with marginalized teens through the Art of Yoga Project. She has led teacher trainings, workshops and retreats around the world. Yoga Alliance (E-RYT 300). To learn more about Sharon Dawson, visit her website, Instagram or Facebook.